Due to these alarming statistics, along with his own personal experience of struggling with alcohol and drug abuse for 25 years, author Daniel Smith decided to publish his story. 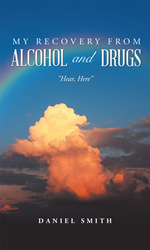 “My Recovery from Alcohol and Drugs: Hear, Here,” was written to provide encouragement and hope for those struggling as Smith once did as well as to provide advice for those trying to help their loved ones in need. “My hope in sharing my struggle and recovery is to aid those who still suffer from a world of addiction and for those who strive to help others turn their lives around for the better,” said Smith. Daniel Smith was born and raised on Detroit’s west side. A troubled fellow at an early age he experimented with alcohol and drugs on several occasions. He became addicted around the age of 17 and did not find recovery until the age of 42. Smith wants readers to know how he was able to recover and live a reasonably happy and productive life to inspire those who have addiction issues or know someone that does that there is hope.